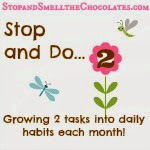 Stop and Smell the Chocolates: Works-For-Me Wednesday: Backwards Edition ~ Budgeting Help? 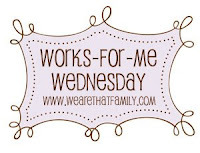 Works-For-Me Wednesday: Backwards Edition ~ Budgeting Help? I do actually have a question for you today. We have not been good about tracking our monthly budget. It would be so much better to have one and we could reach some of our financial goals much faster. Not to mention that it's always good to pay close attention to spending habits and to prepare for the future. Hubs would like to use a budgeting program, but isn't sure which one is best. I know that so many of you have great budgeting systems - some of them your own, some of them online, and some software. What do YOU recommend? Which ones do you have experience with and what has worked best for you? I can't wait to hear your answers - this will be such a help for us! 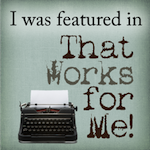 If you need a question answered, you might want to post and link up to WFMW today. Or hop on over to We Are THAT Family and see if you can help answer some more questions! Thank you for your help my friends and have a wonderful day! Our budgeting system is much less "techy", but it's worked for us for over 20 years. We simply agree to a dollar amount, and that's it, we don't spend more than that for the month... period. An extreme budget control system is to put cash in envelopes labeled for those tough categories on payday and when the envelope is empty, no more spending. This post is great! I think you are putting a lot of hard work on your blog. I'm sure I'd come back here more often. You can also visit my site where you can find Professional Nannies or you could also post Nanny Needed and Babysitting jobs if you want for free. Thanks! I don't know how "techy" you want to get, but we've used Quicken for the past 5 years and my husband swears by it. We've gone through several changes...moved twice, had a baby, dropped to a single income...and it's nice to be able to graphically see where our money is going and where we need to alter our expenses. Also makes it alot easier at tax time, as all our financial information is in one place. Well my friend, my husband and I have used the envelope method for almost 14 years now and it brought us through some really hard times because we were on this budget. Here's a really good article about it and you can go from there if you are interested in it. I highly recommend though. 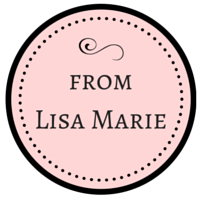 Big the date night envelope is my favorite envelope size hugs to you! We use You Need a Budget. They just came out with a new version that works with both PCs and Macs. I love it! I have used Quicken in the past also, but I prefer YNAB. I highly recommend Mint.com. It is FREE to join and recommended by many "financial gurus". You can choose to input your bank account info. We did and in the 18 months we have been using it, have had no problems whatsoever. Mint.com is basically a FREE version of Crown Financial Myevelopes. Another site to check out is myspendingplan.com It is also based on the envelope paying system. We also use Mint.com. We've had no problems with security (which is some people hesitation with it) after entering our banking, credit card, mortgage, and 401k info into it. It is an AWESOME tracker of everything you do and as mentioned already FREE! It's at least worth checking out to see if it works with your personal spending! We briefly considered the cash in envelopes/jars, but we take advantage of free points on our credit cards - we just need to make sure those balances always get paid off! The budget program has been quite an eye opener! There is nothing like www.daveramsey.com I couldn't give it a higher recommendation. CHanged our lives and helped us to be on the same page financially for the first time in our marriage. Gave us a financial goal and vision. Check it out! Finances are a big part of our 2010 plan here at Chez Underwood. I think we are going to do a semi-modified Dave Ramsey thing ... first goal is to have $1000 in savings. I use to do the envelope system when I was single, and it really kept me on budget. Now Hubby handles all that and he's a whiz at money managing, so we don't have a system right now. I completely agree with Karen and Kim (go to Crown.org), and check out their system, it's really good. We use Quicken to keep track of our expenses. We've used it so long that our version doesn't really recognize years after 1999 (it calls them '05, etc.) And because we've used it so long we also set up a spreadsheet to be able to customize the basic budget report better. The real key to the success of our budget is sitting down together EVERY month and going over the last one and preparing for the current one. You could track all you want, but unless you're on the same page for where the money goes, it won't do you any good. Good luck! Financial peace of mind is worth any effort. We have used Quicken since 2004. Very satisfied. You can use a cash/envelope system with it, or credit cards. It is nice that if you have recurring expenses every month (like groseries, utlitities) it automatically categorizes it for you, and you just have to accept it. I looked into many of the online versions, and I couldn't get them to work without uploading all of our bank numbers. In general, I'd recommend Mint.com (as do familymgrkendra and Kaye above). It's clean, simple and free. Its future is also assured (which is not the case for much financial software). It's been bought by the people who make Quicken and will probably be rebranded as Quicken Mint or something at some point. If you need to do complex financial stuff, then Mint.com might not be enough. Then you're kind of stuck with Quicken. It's not the best software available, but at the moment it's really the only affordable home-user financial software that's any good. There are different versions of Quicken available for different needs. In the end, though, I'm a fan of K.I.S.S., so I'd recommend looking at Mint before you dive into more complicated software. Great post! I set up an Excel spreadsheet with our salary, monthly bills, quarterly bills and yearly bills deducted from that. Then I created a budget for household expenses and savings with what was left. I've been doing this for a year and a half and it's working really well. Oh and my husband has tried to get me to use Quicken, Mint.com and Microsoft Money, but they don't work for me. My system is much easier for me. I use mint.com because it is real time and i know if we are close to going over budget from a quick email. it also emails me on big purchases so I can see if fraud is happening within minutes of someone purchasing it! Whatever software you use - if any - I would still recommend the Total Money Makeover by Dave Ramsey.